Well, this iconic hotel deserves it’s own post. I was so looking forward to coming here and I was not disappointed. This whole area was so much fun. Not just the hotel, but the camping grounds were great and we did a day trip up to Cooktown and Archer’s Point (more on that in the next post). Built in 1875 on the banks of the Little Anninan River, the Lion’s Den Hotel is set on seven acres and is surrounded by 100yr old mango trees and a brilliant example of the tropics of far north Qld (FNQ). There is all sorts of accommodation available here – powered and non-powered sites, safari lodges and dongas. There is a children’s playground a natural swimming hole in the Little Annan River free from crocodiles. We camped in a powered site underneath some gorgeous mango trees that provided shade for much of the day. The swimming hole was so close and, after some hesitation, Pepe also enjoyed the swimming. The cool of the water provides relief from the heat of the day and was a welcome end to the day. Nothing better than a cool off in the river during the heat of summer in FNQ. However, dinner was a sprint from the minute we started preparation through the cooking process to eating and then washing up. All done in record time. Why? Because the March flies come a runnin’ when they smell food and they bite like the devil – even through clothes. They’re still around outside food prep time, but the food brings them in swarms. We had a great product called ‘Insect Off’ which was fabulous. As soon as we put it on, the flies disappeared. That said, the camping was great. Close to the hotel but no real noise to speak of to keep us awake. Again, bear in mind we were there in the off season. Once we had set up camp and cooled off in the River, we decided to leave Pepe at the campsite attached to the ute so we could explore the Hotel. It didn’t let me down. There are a few posters inside which go a long way to explaining different things about the hotel. The origin of the name apparently stems from a number of theories.The first is that a young stowaway called Daniel left his adopted ship at Cooktown and found work in a local tin mine. (The tunnel is up on the high range opposite the present hotel building). The mine had no name when Daniel came to work there, and as the work was underground, it was a strange experience for Daniel. Upon seeing Danial standing in the opening of the tunnel, the owner of the mine characterised him as Daniel in the Lions Den, and the name took to the mine and later to the hotel. The black tin slug, still in the hotel, came from the original Lions Den tin mine. However, according to family of the original owner Annie Ross, the daughter of Annie Ross and her second husband, George Watkin, Annie Louise Watkin (known as Louie) always claimed the Lions Den Hotel was named after an Inn of the same name in Devon, England. (Information supplied thanks to the great grandson of Jack and Annie Ross, Alan and Wendy Davies). The original signatures are long gone from the old hotel bar, but signatures can still be found dating back over thirty years. The oldest signatures are found on the wall facing the main bar and also the wall with the old piano. 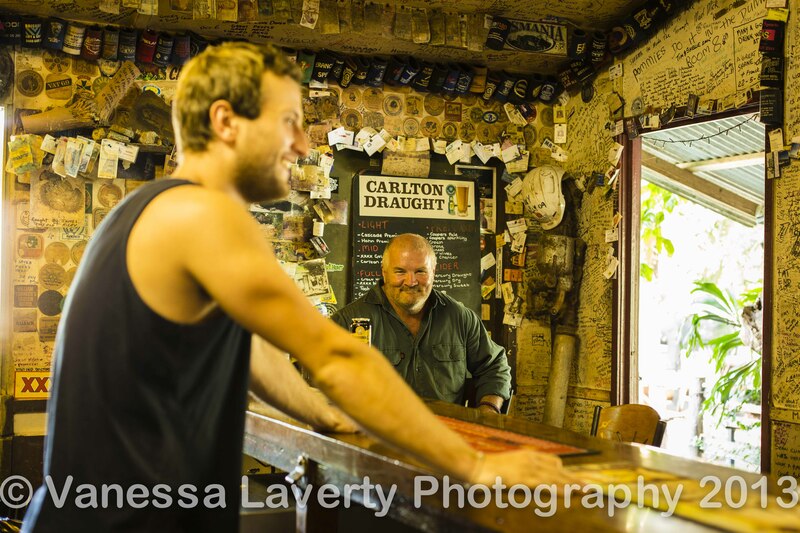 We also got to chatting to the people behind the bar and found out a little of their stories. They were all backpackers form the UK who didn’t know each other before they worked at the Den so largely a coincidence. Ross is from Edinburgh, Scotland and is backpacking around Australia. He has been here for 9 months and at the Den for 4 months. Tonia is from Leicester, UK and has been in Australia for 5 months and at the Lion’s Den for the last 2 months. Fiona has been 12 months in Australia and 4 months at the Lions Den. She is from the Midlands of the UK. We found that everyone in the hotel was very friendly and Damian enjoyed a great chat with Ross in particular. I managed to tear myself away from the inside and went outside to photograph. At night, the Lions Den changes her colours and and puts her glad rags on. The morning we were packing up saw a cicada come to visit. He was coming out of his cocoon and unfurling his wings so grabbed my macro and started shooting. We had a great time at the Lions Den – both in the camp ground and in the hotel. Personally, I can’t wait to go back. We were a little disappointed though to hear that the Creb Track is about to be completely sealed, or that’s the rumour; the road from Lakeland to Cooktown is now completely sealed and the road from Lakeland to Laura is now sealed. I would love to have experienced the dirt roads and corrugations for myself but perhaps thats just because I’m a romantic. I’m sure that it is all for the better, particularly for the locals so I shouldn’t be selfish. In the next post, Damian takes me up to Cooktown and Archer’s Point for the day and to say I fell in love with Cooktown, is an understatement. Vanessa and Damian, you have done a fantastic job with your blog. You’ve recorded everything in such rich detail. The photos make it just perfect. Thank you so much for your kind comments Des. I hope you enjoy further posts that I make.